Another Monday, friends! Did you have a good weekend? I spent it shopping in Seattle with eight buses packed full of 400 women. I can now officially serve mimosas in a moving bus without spilling. I think I’ll put that on my resume. Although, I did fall into the lap of one of the ladies, so, maybe I shouldn’t get ahead of myself. 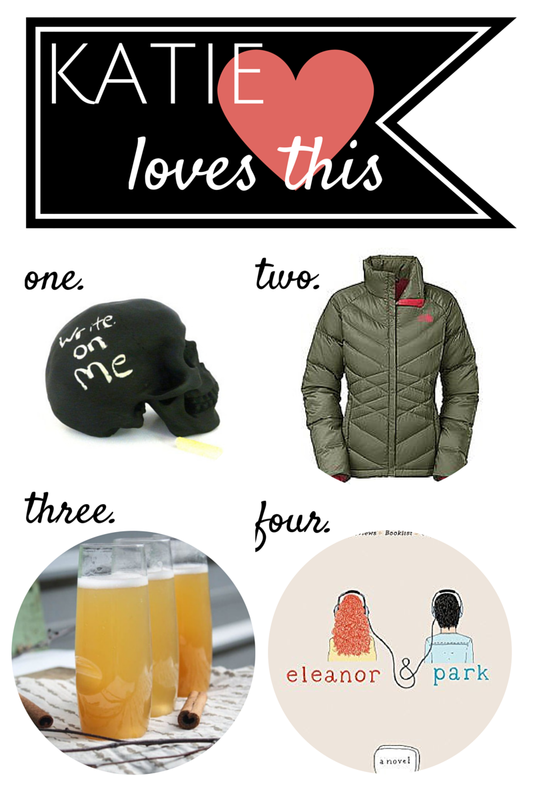 Here are some favorites from the past week… What are you loving? I almost, almost bought these DV by Dolce Vita sneakers at Nordstrom this weekend, but I needed an 8-1/2 and they were going to have to order them for me, so I passed. But, I love them. A lot. Santa, are you listening? These feather gift tags caught my eye on Pinterest and, as it turns out, they are a free printable from Love vs. Design. Confession: I have an entire Pinterest board dedicated to gift wrapping ideas. Do you shop at Trader Joe’s? I’m obsessed with their Pumpkin Cranberry Crisps and will happily eat an entire box in one sitting. (There isn’t THAT much in there, really.) I love them with a little goat cheese on top. Seriously. The entire bag. Yum. I love this DIY Thanksgiving Table Runner. I spotted it on Pinterest and finally hunted down the original post on Spoonful of Imagination. Maybe we’ll get our own table runner started this year with the kiddos. Because that’s exactly what I need in the midst of cooking Thanksgiving dinner… kids with paint on their hands. This entry was posted in Katie Loves This, Life and tagged 2014, Katie Loves This on November 17, 2014 by Katie Kavulla. The last time I made chili for dinner, it was lame. It was a basic recipe and it took a LOT of extras to make it taste like anything. Loving these chili recipes for fall from around blog-land. Hoping to find a new favorite. This new Salted Chocolate Chip Cookie Mix from Not Without Salt. Enough said. Buy some for everyone you know. And then more for yourself. Remember that family who did the Christmas jammies rap? They had a new song drop for Halloween, Kin and Moose: Gin and Juice Halloween Parody from the Holderness Family. Hilarious, as always. The planner that I’ve been using since I was in college (that was a LONG TIME AGO) didn’t come back this year. This is the new version and I’m trying to get on board, but really, this paper calendar loving girl is in mourning. This entry was posted in Katie Loves This, Life and tagged 2014, Katie Loves This on October 27, 2014 by Katie Kavulla.